Following on from some great feedback about our last blog post we are going to keep on the theme of turtles. There is something about sea turtles that captures the imagination of adults and kids alike. There just doesn’t seem to be an age where you can longer get excited about seeing a turtle and I’m yet to have a diver complain that we spent too much time with a turtle when we have come across one underwater. The only species not found on the Great Barrier Reef is Kemp’s Ridley sea turtle as it is only found in waters close to the USA and Caribbean. The most common species of turtles we see on the Agincourt and Opal reefs (the reefs we dive daily on our Port Douglas diving trips) are the Green and Hawksbill turtles. Loggerhead and Olive Ridley turtles are occasionally seen and the Flatback and Leatherback turtles are only very rarely seen on the outer reef off Port Douglas. Although turtles aren’t seen on every dive we do see them most days. Turtles are usually fairly relaxed around divers but will get scared off by big groups of divers or people coming too close too fast. 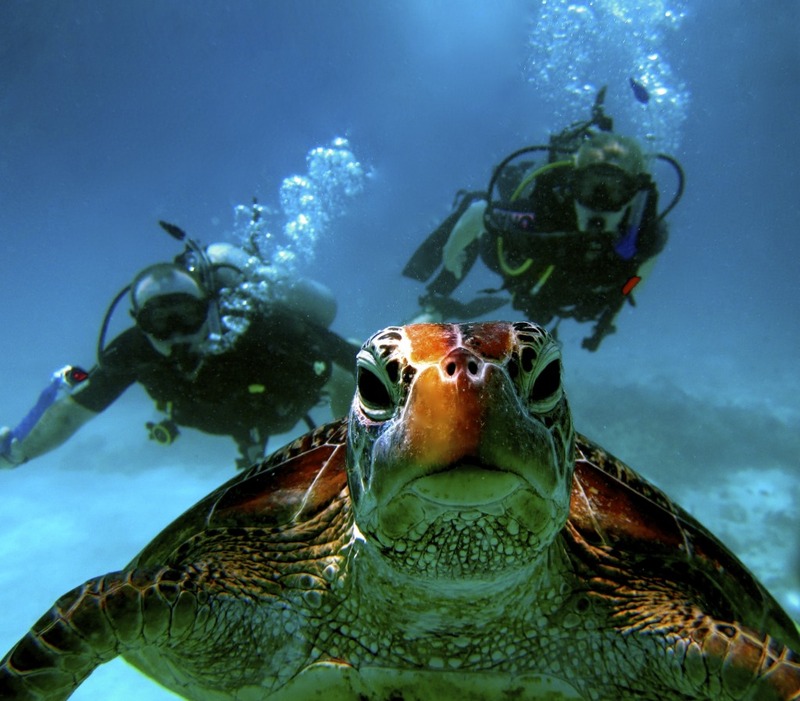 The best way to increase your chances of seeing a turtle and getting to spend time with it underwater is to dive with your own private Blue Dive guide who will teach you the best way to approach these beautiful creatures. If you are lucky we will even take your photo with them! All species of marine turtles have a very similar life cycle. They grow slowly and take between 20-50 years to reach sexual maturity. The lifespan of a wild turtle is believed to be 60-80 years. If a baby turtle survives to adulthood, and only 1 in 1000 do, once they are ready to mate they will migrate up to 3000km to return to the very same island or stretch of beach they were born on. We have all seen the documentary footage of turtles laying their eggs, the baby turtles emerging from the sand and making a mad dash to the sea but what a lot of people don’t know is that a female turtle can lay several clutches of eggs over several weeks. A female turtle will only lay eggs every 2 to 8 years but can lay hundreds off eggs each time. 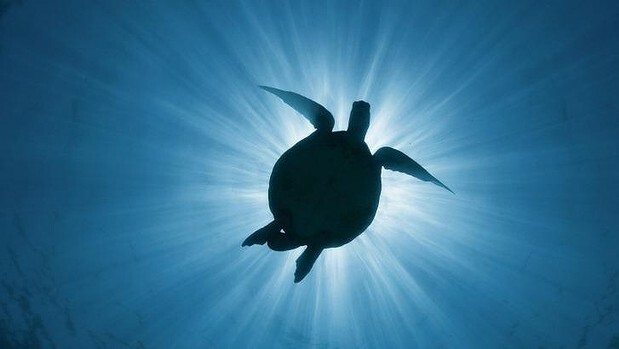 For more information on the Lifecycle of a turtle visit the Great Barrier Reef Marine Park authority’s turtle webpage. The turtles we see on our Port Douglas dive and snorkel trips are usually adults foraging for food, resting and hiding amongst the coral or just cruising along as turtles are so well known to do. If you have no luck seeing a turtle on your diving or snorkelling trip to the Agincourt or Opal reefs then another great place to try your luck is the Low Isles. These are 2 islands near Port Douglas and they are the most well known turtle spotting area in the region. Although the Low Isles are a snorkel only location we often stop here on our private Port Douglas dive and snorkel charters. With over 50 resident turtles and some beautiful fringing reef around a white sand island it is a very nice place to spend a day aboard a luxury Port Douglas private charter vessel. 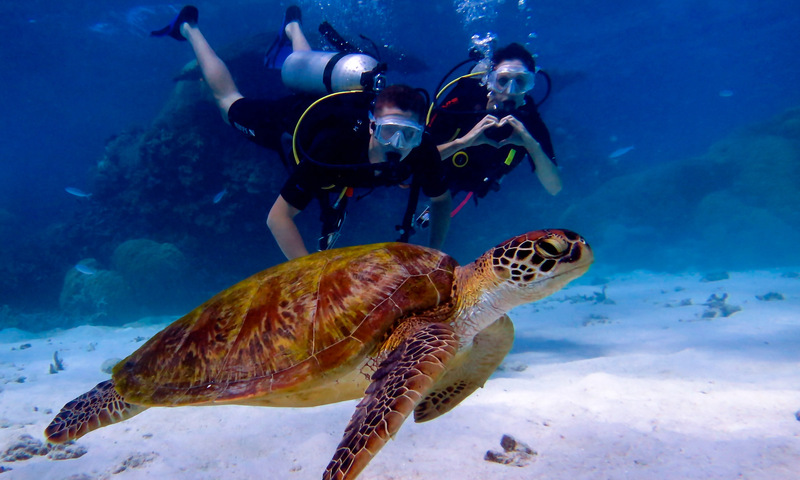 Turtles are found year round on the reefs of Port Douglas and our experienced dive instructors usually know the spots to give you the best possible chance to find these wonderful creatures.